A small area of modern Pembrokeshire located on the southwestern flanks of Mynydd Preseli, within the medieval Cantref Cemaes. Cemaes was brought under Anglo-Norman control in c.1100 by the Fitzmartins who retained it, as the Barony of Cemaes, until 1326 when they were succeeded by the Audleys. The Barony was conterminous with the later Hundred of Cemais, which was created in 1536, but many feudal rights and obligations persisted, some unti as late as 1922. During the medieval period, the northern half of this character area was granted by Nicholas Fitzmartin in a mid 13th-century charter to the freeholders of Cemaes as part of the great common of Preseli within which they had rights of common pasturage and turbary. 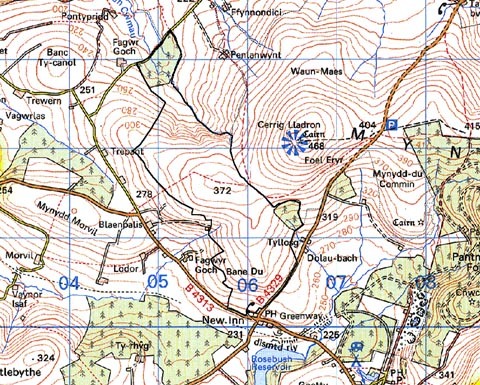 This corresponded to that half of the area north of a pronounced east-west bank, the 'palis' (or pale) which, though it was used as a boundary to separate the common from the land to the south, pre-dates Fitzmartin's charter, by which time it was already being known as the 'Via Flandrensica' or Flemings' Way. It is named as such in this and succeeding documents. It has also been regarded as a prehistoric track. The southern part of the Banc Du character may have formed part of the former manor of Redwalls, the core of which lies at Fagwyr Goch just southwest of this character area. It was first mentioned in 1293 when Robert de Vale, Lord of Dale in Pembrokeshire, obtained from King Edward I a grant of a weekly market and a three day annual fair 'for his manor of Redwalls'. The Vales had acquired the manor from the Barony of Cemaes during the 13th century. Neither the date nor the manner of this acquisition are known but its location, and the fact that the manor was never assessed in terms of knight's fees, suggest that it was a 13th century creation - a large-scale assart onto relatively poor land. During the 16th century the manor was held by both 'English' and 'Welsh' tenure, as recorded in an Extent of the Barony compiled in 1594. However, it appears also to have been in decline and, in total, only four tenements of demesne - which may have occupied Mynydd-du character area - were recorded, along with gale tenants and rights of herbage for cattle grazing on the field strips. The southern part of the Banc Du character area may, however, represent an area of common grazing appurtenant to the manor. Alternatively, it may have been included within the neighbouring Morvil which was assessed as 2 carucates of ploughland held directly from the barony by 'mean' - or limited manorial - tenure. At any rate, both parts of the character area remained as unenclosed moorland until a late date, the pattern of large regular enclosures being typical of late 18th-century enclosure. The process was complete by the tithe survey of 1839. No settlements are shown on the tithe map. The situation has not changed much over the past 160 years, but the northern end of the area was planted with coniferous forest in the second half of the 20th century. Banc Du historic landscape character area consists of a band of semi-enclosed land on the southwestern flanks of Mynydd Preseli lying between 250m and 360m. Most of this landscape comprises smooth slopes, though occasional rocky outcrops are present. Apart from two small 20th century coniferous plantations, this is a treeless landscape. 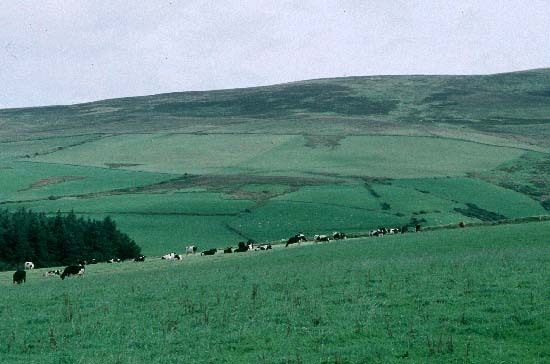 Land-use is predominantly improved pasture with pockets of rough grazing and rushy wetter ground in hollows. The very large enclosures are formed from stone banks or earth and stone banks. There are no hedges on the banks. Wire fences running along the crests of the banks provide stock-proof boundaries. There are no lanes or tracks. With the exception of a post-medieval bridge, there are no structures/buildings within this character area. Recorded archaeology is restricted to the prehistoric trackway/medieval boundary bank, and two further banks of unknown date and function, one of which encircles the highest point of Banc Du. There is also a possible post-medieval building site and/or bronze age round barrow. This is a fairly well defined area, lying between the higher open moorland of Mynydd Preseli to the east and settled and enclosed farmland to the north, west and south.